Route. 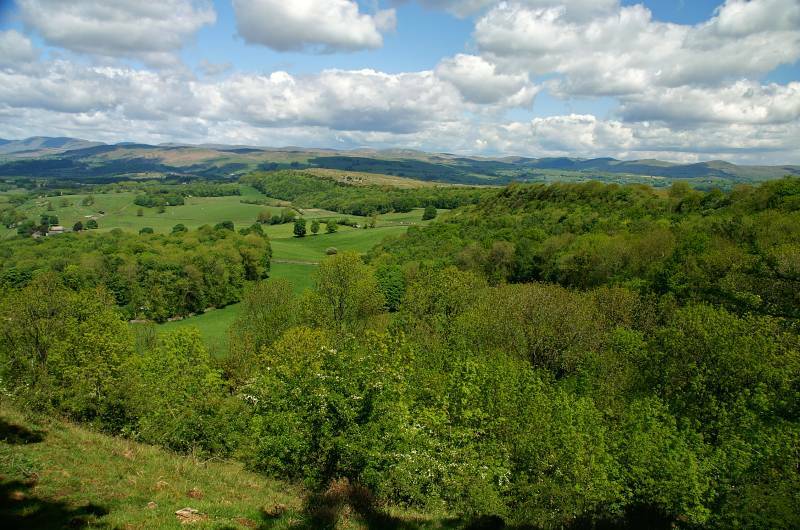 Kendal (New Road) - Fell Side - Serpentine Woods - Kettlewell Crag - Helsfell Nab - Cunswick Scar - Underbarrow Road - Scout Scar - Helsington Barrows - Bradleyfield - Kendal Racecourse - Castle How - Kendal. Notes. I wouldn't normally attempt this walk from the town centre, I thought I might show you some of the more quirky corners of this old market town, unfortunately my plans were thwarted by bright yellow salt boxes, wheelie-bins, the dreaded recycle boxes, plus some of the more interesting shop fronts were swathed in scaffolding. Kendal could once boast 150 yards all running from west to east down to the river, the short sighted planners of the early 60s called them slums, a good excuse for re-development, I used some of the remaining yards and narrow alleyways to guide me away from the traffic on a quest to reach Serpentine Woods, the start of today's high ground. 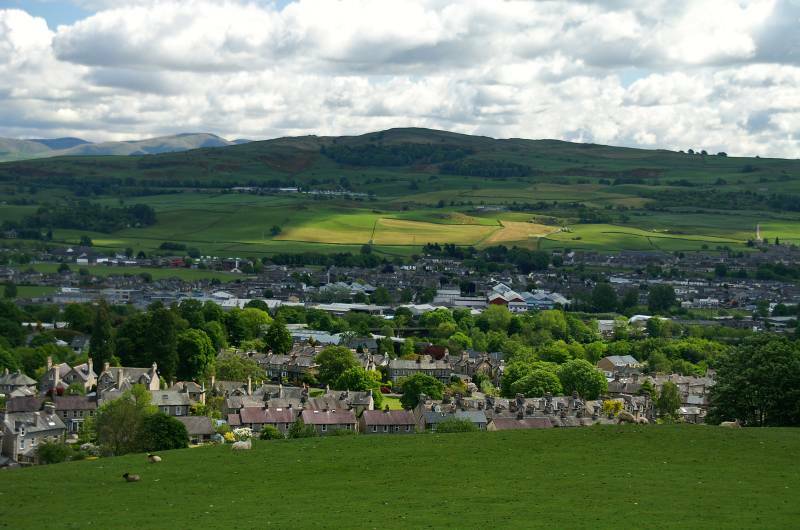 From the town centre I opted for Wainwright's Yard, a modern yard named to commemorate Kendal's famous adopted son. My route ascended Fell Side to reach Serpentine Woods, a short wander through dense woodland saw me step out into stunning views. Wandering along The Heights I passed the small quarry on Kettlewell Crag to reach Helsfell, then the footbridge over Kendal By-pass. A short easy ascent through fields followed before the large cairn tilted into view, this was the summit of Cunswick Fell, Cunswick Scar runs south marking the eastern boundary of Lyth Valley, my route was simple just follow the scar. 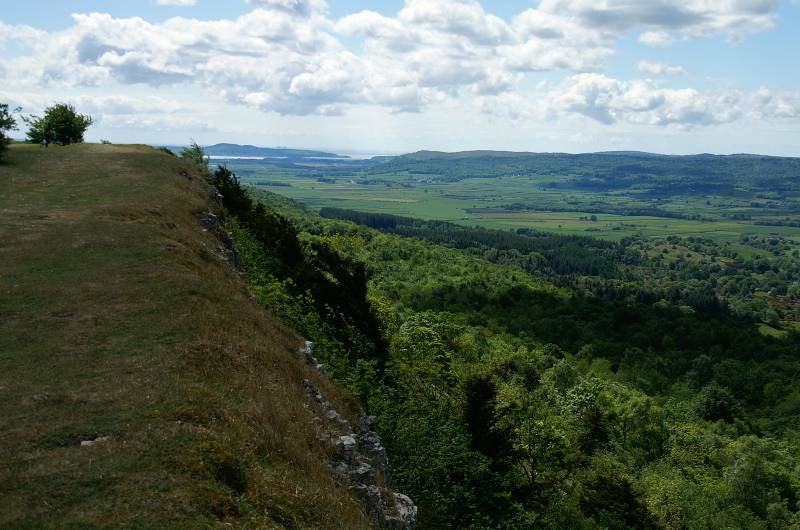 Above Scar Wood I wandered, crossing Underbarrow Road before ascending Scout Scar, still heading south, the path clings to the edge of the escarpment, after one mile a large cairn at Helsington Barrows marked my descent. 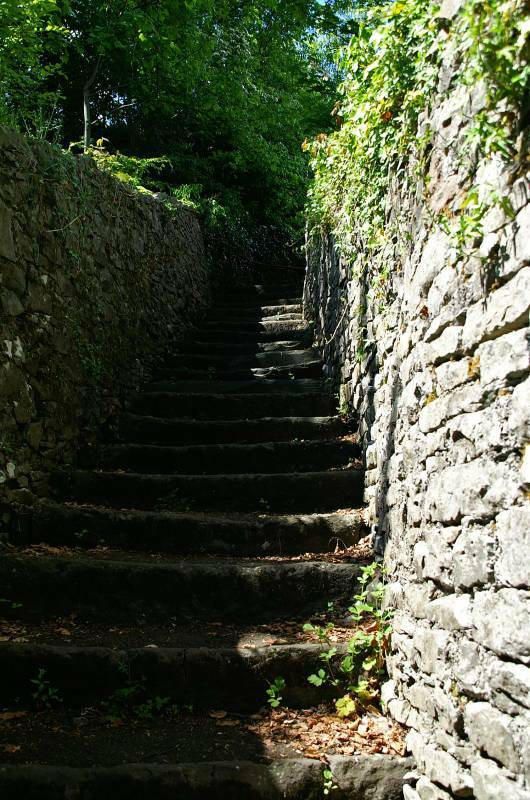 On a good path I descended crossing Bradleyfield then Kendal Racecourse before stepping onto the tarmac of Brigsteer Road. My route back into town was mainly over tarmac, paying a quick visit to Castle How, the site of Kendal's first castle, before hunting for a quaint slice of old Kendal to photograph free of wheelie-bins and scaffolding. 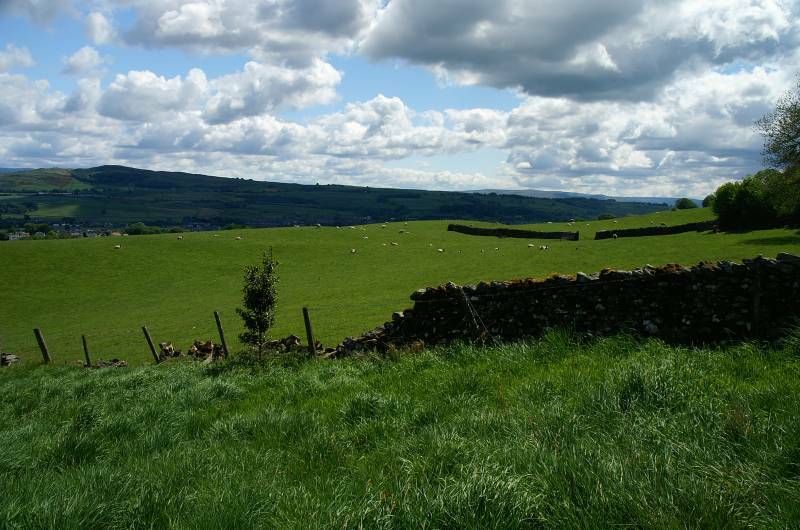 A view down one of the many alleyways on Fell Side, the hills across the horizon, the Whinfell ridge. 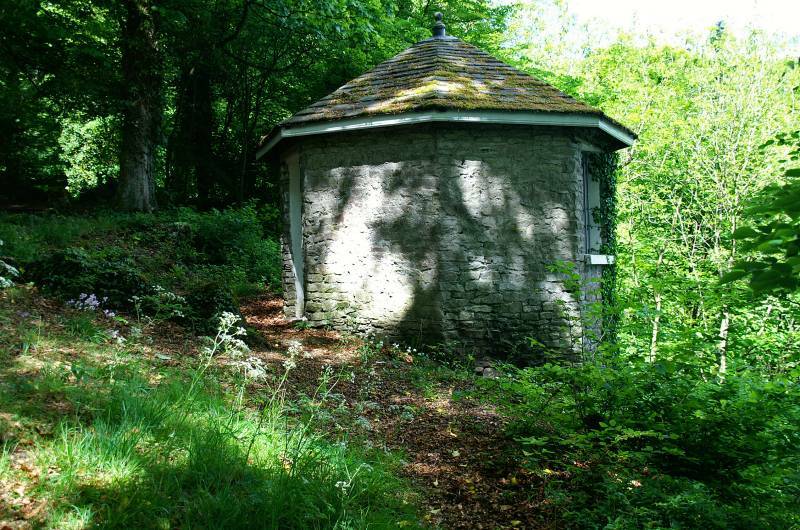 Dappled light on the Summer House in Serpentine Woods. 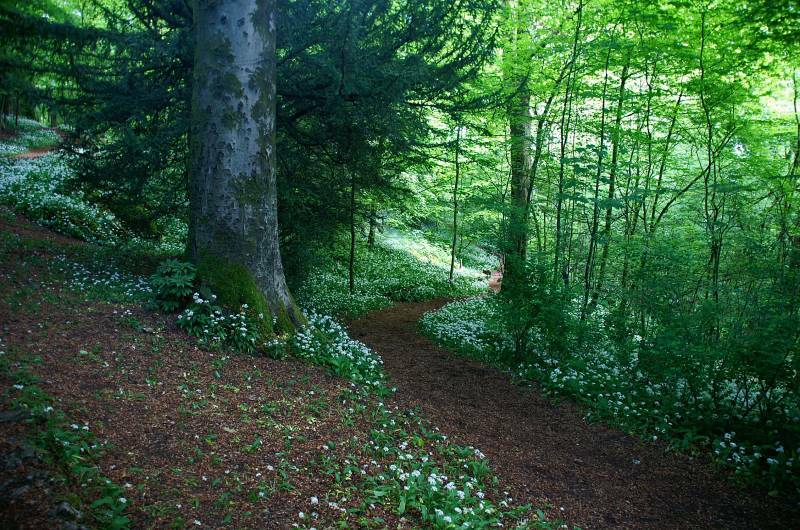 Paths edged by Wood Garlic, the smell was overpowering. I've just stepped out of the woodland into stunning views, Whinfell over the Kent Valley. 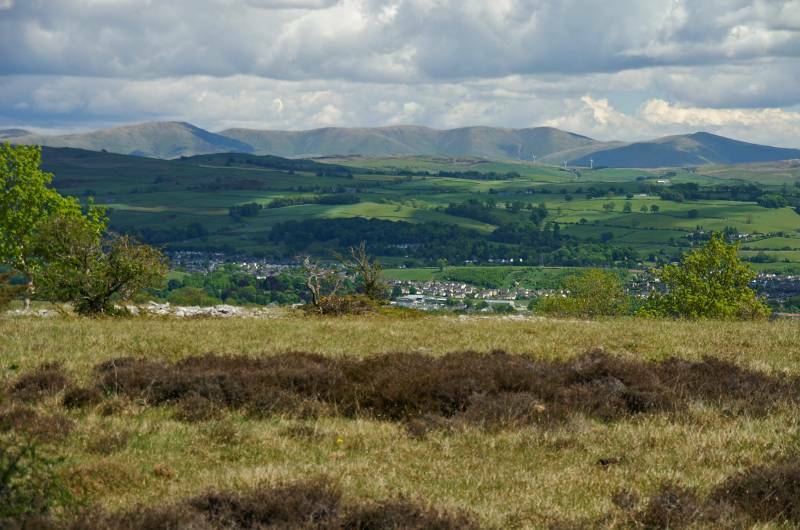 Looking to Benson Knott above Kendal. And again this time from the shadow of Helsfell Nab. 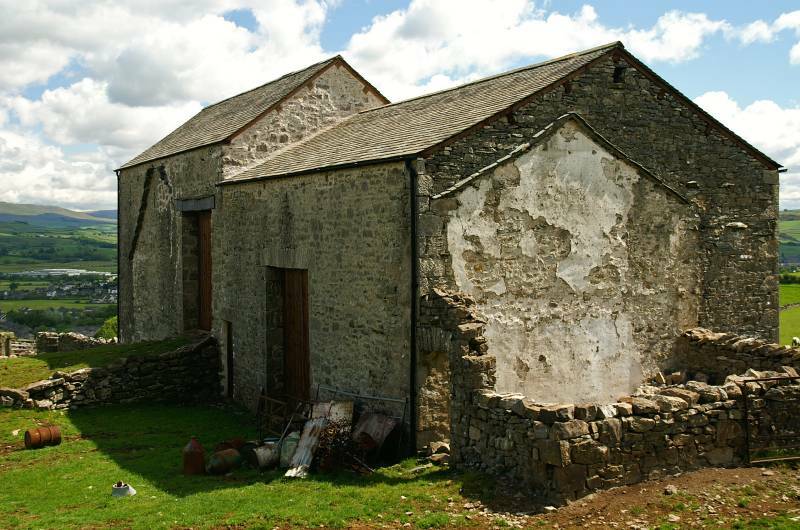 My route passed this rather substantial barn before ascending to the footbridge spanning Kendal By-pass. 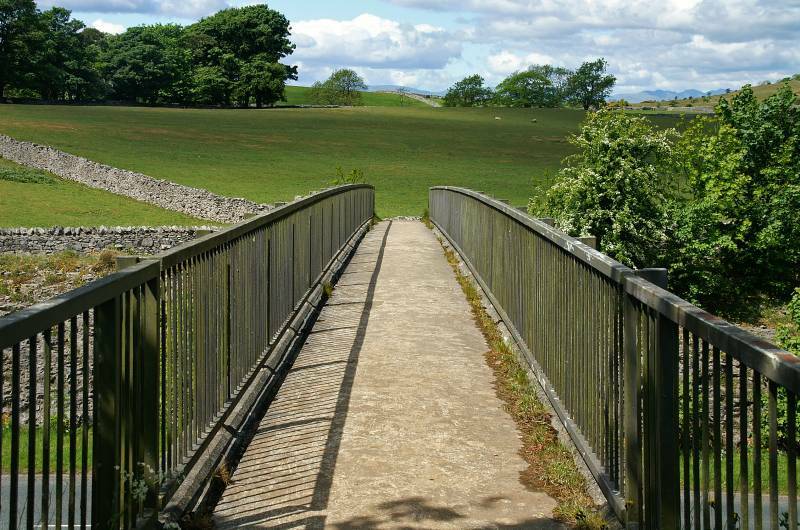 Gateway to the Kendal Scars, also provider of safe passage across the By-pass. 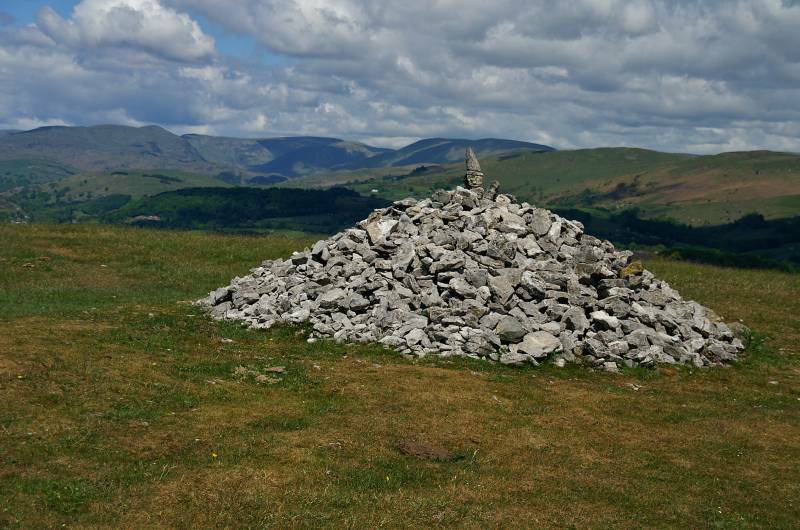 The summit Cunswick Fell with stunning views to the head of Kentmere. To the west tomorrows destination the Coniston massif. 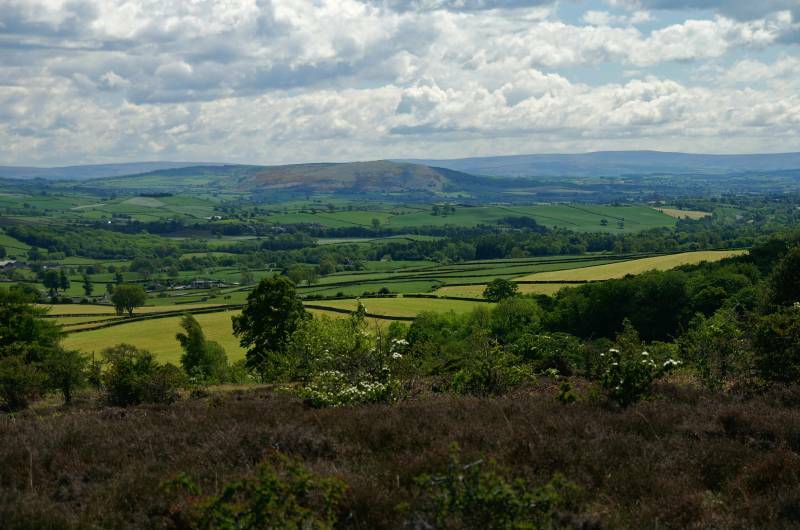 I've looked to the north and the west, I may as well show you the views to the east, Benson Knott and the Howgill Fells. 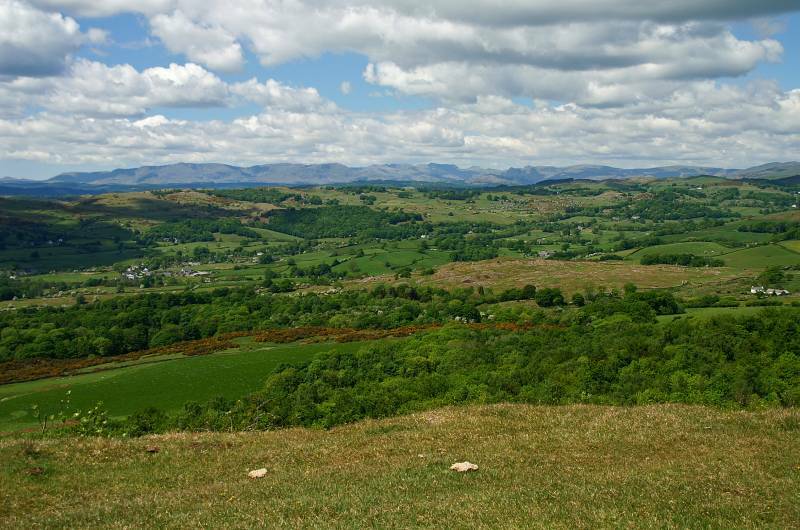 Heading to Scout Scar with views over Kendal Fell. Cunswick Scar. 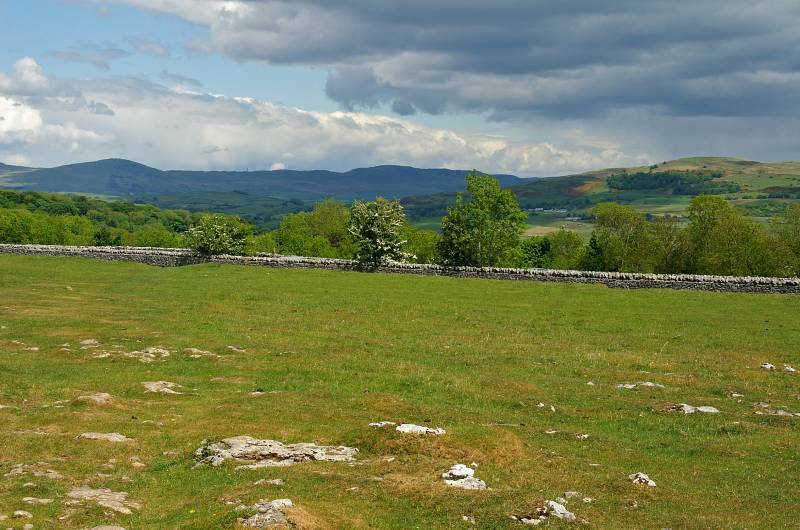 seen from the short easy ascent of Scout Scar. 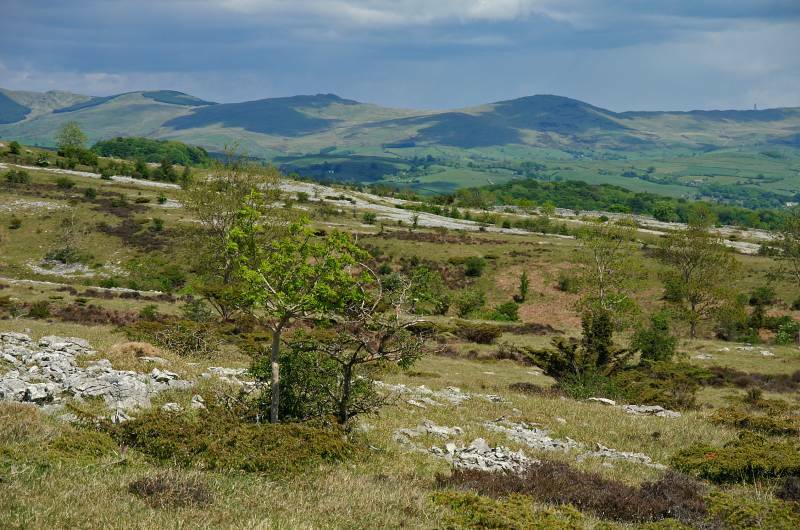 On the Scout Scar plateau with wonderful views over Lyth Valley. 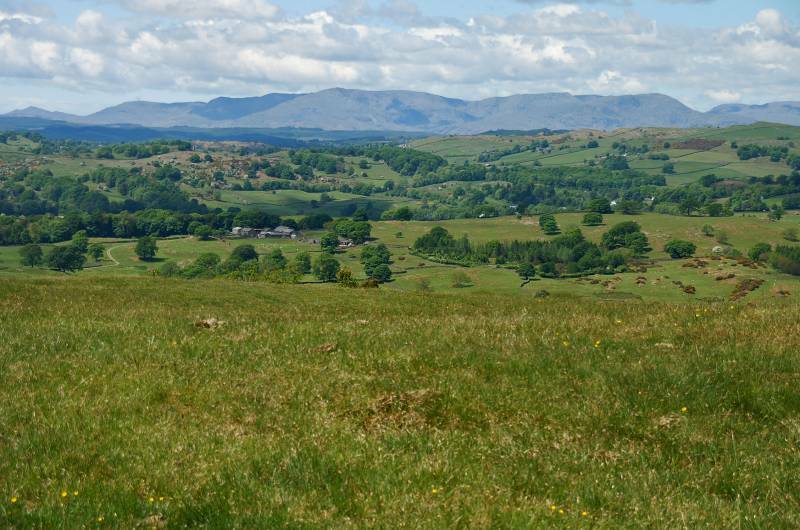 In the other direction, the Kentmere Fells. 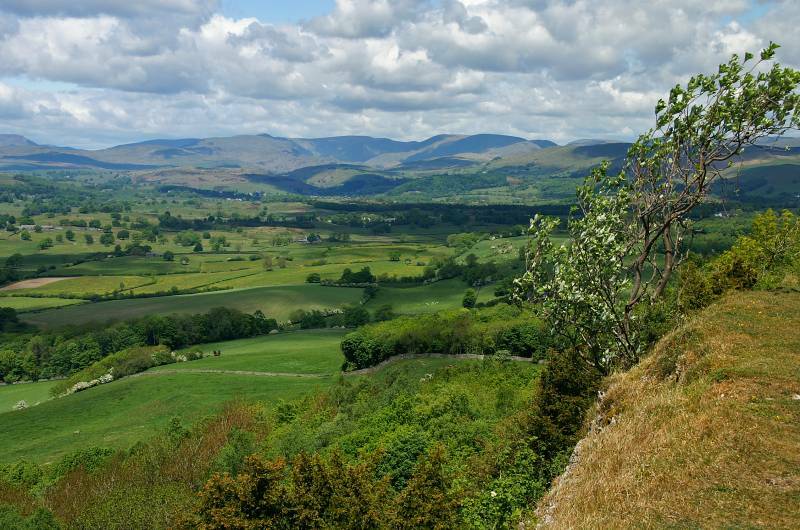 "This (Scout Scar) must surely be one of the finest viewpoints in England, for you can see at least 120 hills and mountains in the Lake District, Yorkshire and Lancashire from it, as well as less interesting features such as Blackpool Tower far across Morecambe Bay", Harry Griffin. Quite appropriate as these are the areas this web-site covers. 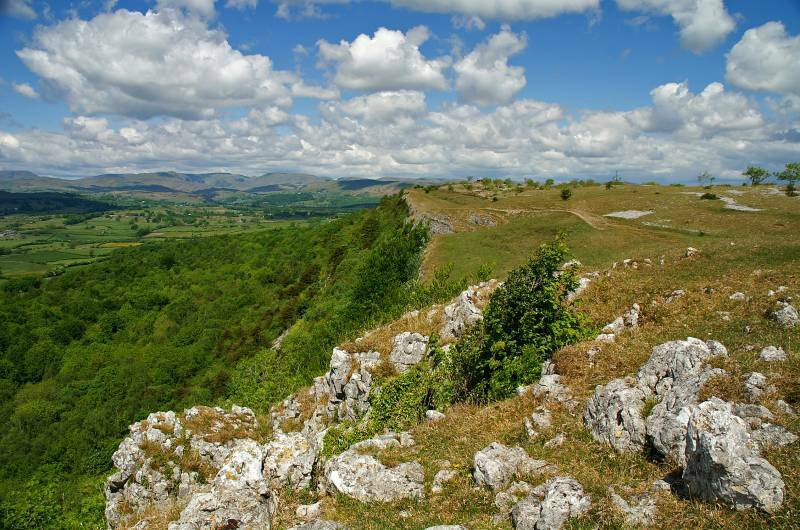 On Hodgson's Leap looking north along the Scout Scar cliffs. 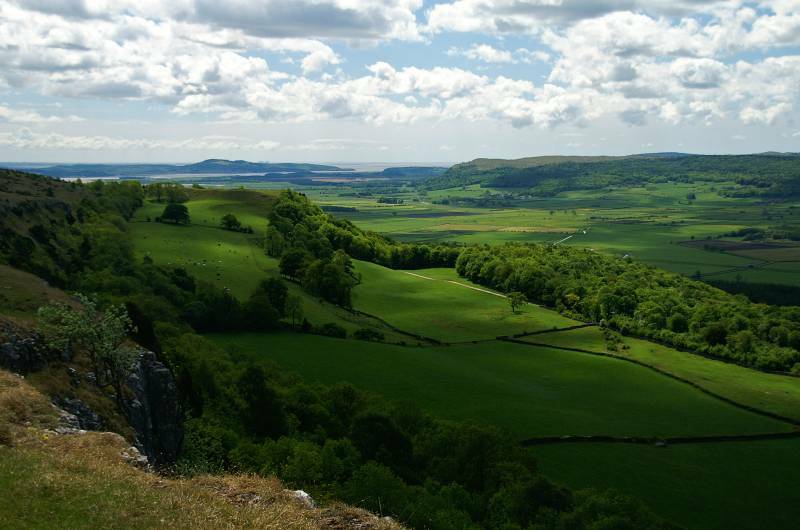 Soak up the views from Hodgson's Leap, Arnside Knott across upper Morecambe Bay with Whitbarrow to the right. 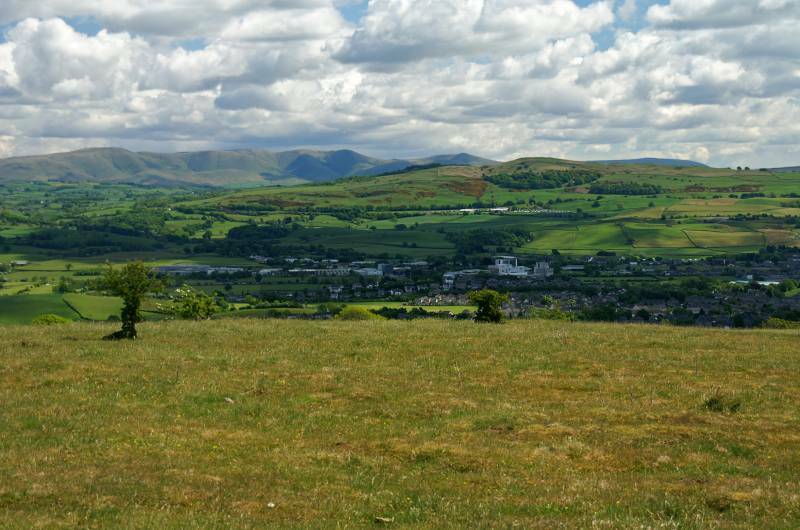 Wainwright's herd of sleeping Elephants, the Howgill Fells. Seen from Helsington Barrows the rolling summits of the Whinfell Ridge. 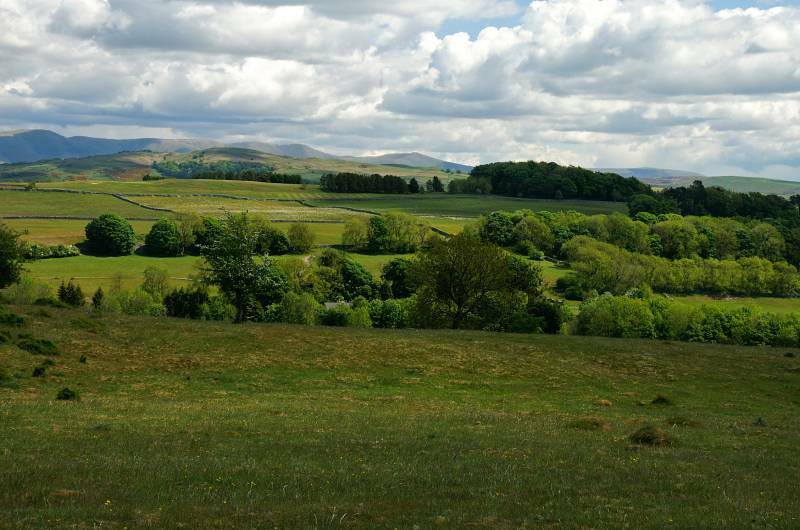 Seen from Bradleyfield, Farleton Fell backed by the blue/grey hills of Bowland. 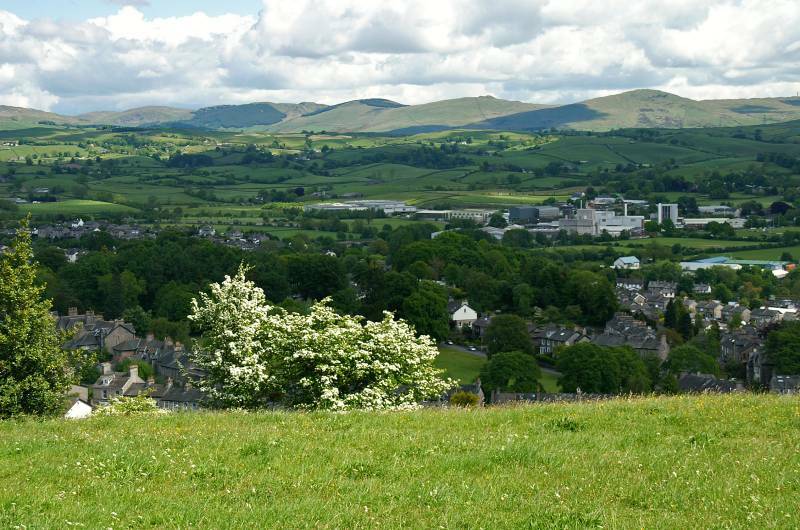 Crossing Kendal Racecourse I ponder the question, when was the last time anything actually raced here?. 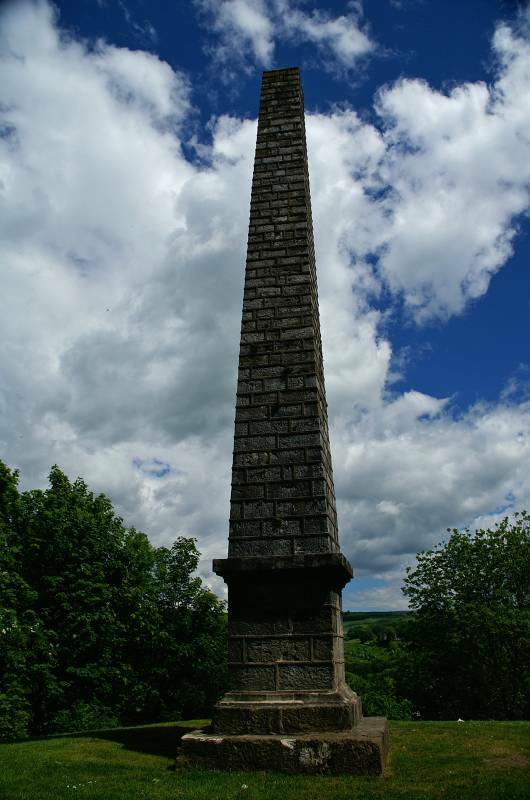 The Monument on Castle How, erected in 1788 to celebrate the centenary of the revolution in 1688, Castle How is widely recognized as the site of Kendal's first castle, a motte and bailey built around 1092. 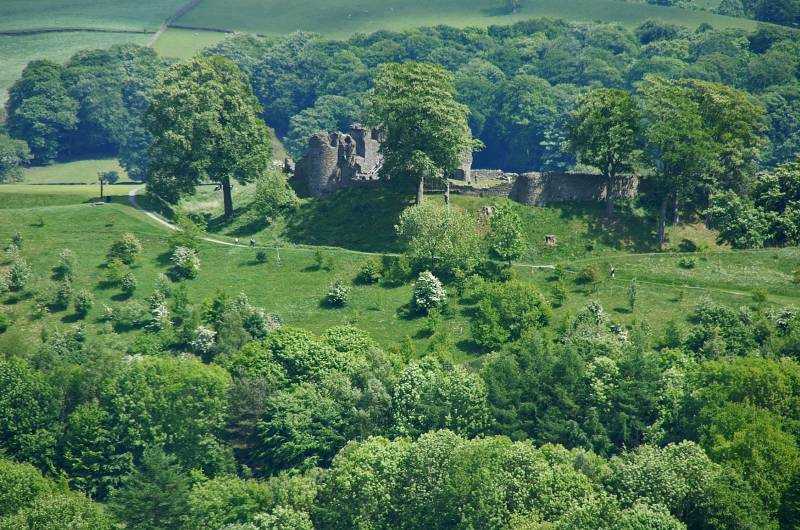 From one castle to another, Kendal Castle built in the 12th century. 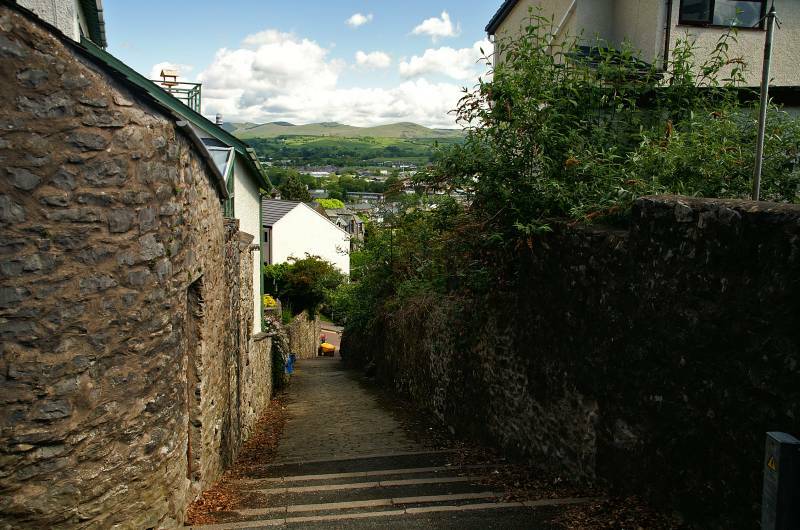 My descent route back into town, more narrow alleys and lots of steps. 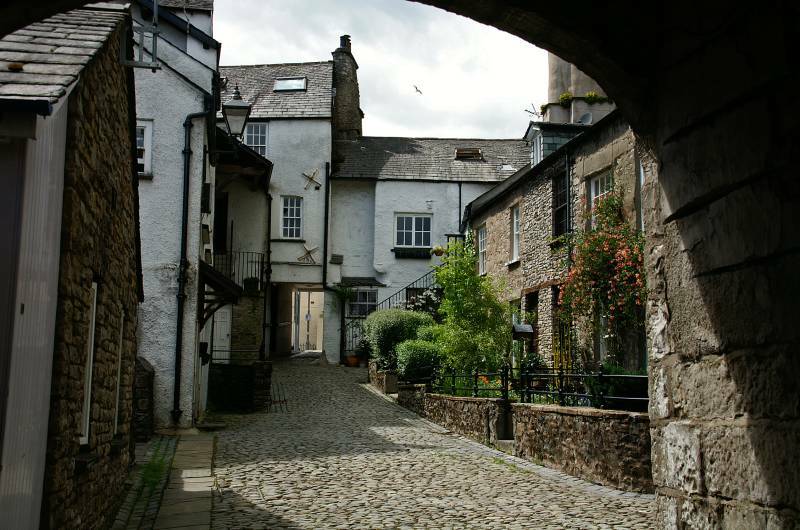 Not a wheelie-bin or re-cycle box in sight, Yard No 83, Dr Manning's Yard, a slice of old Kendal.